Historically, the Beckhard change equation can be seen as a major milestone in the field of Organisational Development in that it acknowledged the role and importance of employee involvement in change. It represented a significant shift in management thinking from the "command and control" of the industrial age to a people centric approach. Richard Beckhard has long been considered one of the founders of organisation development and the creator of the core framework for a large system change. He wrote eight books and numerous articles and as a practitioner for nearly 50 years, he helped many organizations improve their effectiveness via a people-centric approach. (1) Determining the need for change - We must be clear why things need to change. We need to articulate why it is unacceptable and undesirable to conduct business in the same way. If we are not dissatisfied with the present situation, then there is no motivation to change. (2) Articulating a desired future - Ensuring that your employees fully understand and can picture their future as part of a changed organisation and can see their place in the new organization. (3) Assessing the present and what needs to be changed in order to move to the desired future - Making sure that each employee understands what they need to know what to do to prepare themselves for the change and what steps they need to take in order for this change to be successful. (4) Getting to the desired future by managing the transition - using external specialist help and appropriate processes. The change equation is expressed as Dissatisfaction x Vision x First Steps > Resistance to Change. If any of these factors are missing or weak, then you’re going to experience resistance. In my experience, nobody voluntarily initiates a change in their life unless there is an actual or perceived threat to survival and / or an aspirational desire linked to a personal vision. 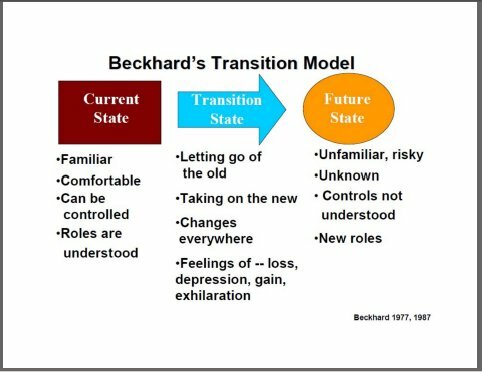 So the Beckhard change equation is - in my opinion - a change model that recognises the basic psychology of change at the personal level.